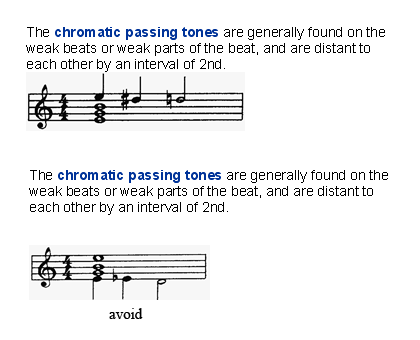 the chromatic passing tones are generally placed on the weak beats. the same altered and non altered note can be heard simultaneously. 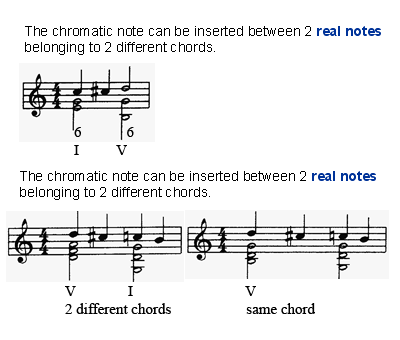 the chromatic passing tones are placed between real notes of the chord only. the chromatic passing tones are found in the upper voice only. Created by a teaching professional musician and a team specialized in website management, Musiclassroom.com is a real musical online pole offering to all musicians, whatever their style or level, a non limited access to the different services of music education and production. The MusiClassroom Academy proposes a high quality of music education in the main fields of music theory, accompaniment, harmony, composition, arranging, orchestration, piano, guitar, singing, ear training, classical music, jazz and song writing. This program is divided into 3 levels of skills : beginner, medium and advanced, and includes regular evaluation tests. The MusiClassroom Scores offers to musicians the opportunity to purchase a large number of single sheet music and tabs, as well as a collection of scores for piano, guitar, voice and various instruments, educational methods, books, cd’s or dvd’s, a necessary further training for lessons proposed in the Musiclassroom academy, and finally, different formats of blank sheet music by free download, that have been conceived for various instrumental or vocal bands. The MusiClassroom Studio opens to amateurs and professionals the road to music production, including arranging, recording, remixing and mastering for their own compositions. The MusiClassroom Artists brings to light new artistic talents to thousands of visitors, acting as a real artist manager and distributor, by allowing paying mp3 downloads and album purchases. The Musiclassroom TV, first online educational tv channel, broadcasting 24 hours a day music educational programs, video clips as well as artist interviews. These professionals will talk about their passion and present their current events. The Musiclassroom Shop allows visitors to purchase online and receive by free shipping, numerous single sheet music, scores or music educational methods in a secure way. They may also subscribe to online music lessons, or inquire about available studio or artistic services. Prices are indicated in euros all taxes included. These prices include all logistic and shipping fees. For international shipping ( outside France ), the product is considered as an imported item. All products, whatever its origin, is payable in euros (rate = 6,55957 Francs). Yves Feger has the right to change the prices at any moment. Products are billed according to the date of purchase. They remain the property of Yves Feger until the full payment. Your orders are prepared on the web at the following address, www.musiclassroom.com, and sent by postal mail. Please note: online sales are accepted only. Orders are sent to the address you have indicated during the purchasing process. Products are sent 24 hours after payment. In case of unusual delay, an email will be sent to you. The payment is due when ordering, by cheque or credit card in our secured shop. ARTICLE 5 - SATISFIED ? You can return the product within 48 hours of reception (if not conform to your order) and you will be charged for the return shipping. Purchased items will be exchanged only. The return address will be the same as on the order. We will exchange the products that are not conform to your order within 7 days after reception. The exchange will be made to the customer’s name and address. If the customer does not wish to exchange his product, we will allow him a credit equal to the amount of the purchase. This credit will be available for all products found in our shop: www.musiclassroom.com. No cash on delivery is possible. NB: Promotions are no refundable nor exchangeable. For any information or question about your order, our customer service is available at this email : contact@musiclassroom.com (from Monday to Friday, 9 am to 6 pm). All texts, comments, illustrations, images or videos found on: www.musiclassroom.com are protected by copyright in the world. Thus, regarding to the intellectual property code, any private use is forbidden without a director’s authorisation. All entire or part reproduction of this content is strictly forbidden. Products are conform to the French legislation. Yves Feger’s responsibility will not be engaged in case of non respect of the delivery country’s legislation. It will be the customer’s responsibility to get local information about importation of ordered products. Images and texts that illustrate our products are not legally binding documents. Consequently, Yves Feger’s responsibility will not be engaged in case of non binding texts or images. Musiclassroom.com will not be responsible for unrespect of this contract in case of “out of stock”, postal or transportation services strike. Yves Feger’s responsibility will not be engaged in case of indirect damages such as : bankruptcy, operating costs or unexpected expenses. Some of the musiclassroom’s links can lead to external websites and Yves Feger will not be responsible if these websites do not respect legal legislation. This contract respects the French legislation. This contract language is in English. But in case of dispute, the French court will be competent only. Musiclassroom.com makes a pledge not to divulge customer’s personal information. They are confidential. They will be used for internal purpose only (order treatment). Consequently, according to the law of January 6th 1978 concerning the law about internet and liberty, you have the right to access or modify your personal information. In this case, you must send us an email or a letter. This website is one of the Musiclassroom’s portal. All rights reserved, including pictures, texts and videos. The copy of the entire website or just a part of it is strictly forbidden except with the director’s authorization only. According to the law July 1st 1998, regarding the legal protection of all files and relative elements such as : texts, logos, graphics, images and photography, are the exclusive property of Musiclassroom. All use, including copying of a part, modifying, distributing, transmitting or exposing this content is strictly forbidden without the authorization of Musiclassroom. This copyright is protected by the French law and by the international regulations about intellectual property and especially by articles : L.335-2 and L.335-3. All violation of these rights will lead to legal proceedings. © 2007-2010 Musiclassroom. All Rights Reserved.